After days of teasing, Amazon’s Prime Day sale is here. We have listed down some of the top tech deals that are on a sale during the event. Amazon Prime Day Sale is kicking off today and will last till midnight, July 17. The sale will last for 36 hours and it is exclusively open to Prime members, With over 1 million products on a sale. 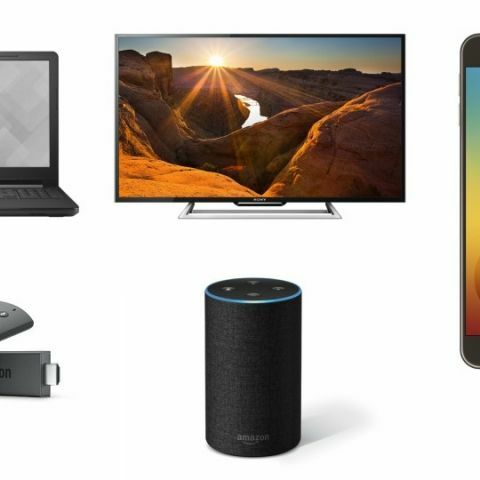 We reduced your labor and picked out some of the best deals on gadgets like smartphones, TVs, and more. You will find some big brands in the list, which are available with some pretty good discounts. The LG V30+ sports a 6-inch QHD+OLED full vision display with a resolution of 1440 x 2880 pixels. The smartphone is backed by 2.45GHz Qualcomm Snapdragon 835 octa-core processor, which is paired with 4GB RAM and 128GB of internal memory. As far as the cameras are concerned, it has a 16MP+13MP dual sensor at the back. While the front is equipped with a 5MP unit. Click here to buy. The Samsung Galaxy On7 Prime is available on Amazon with a hefty discount today. The smartphone sports a 5.5-inch long FHD display with a resolution of 1080 x 1920 pixels. The device features a 1.6GHz Exynos 7870 octa-core processor, which is paired with 4GB RAM and 64GB of internal memory, which is expandable up to 256GB. When it comes to the camera, it has a 13MP sensor at the back and 13MP unit at the front as well. Click here to buy. The Asus Zenfone 4 Selfie Pro let users shoot a selfie video in 4K UHD resolution. The smartphone features a 24MP dual lens at the front with a Sony IMX362 dual-pixel image sensor. On the other hand, The back has a 16MP unit, which comes with the SonyIMX351 image sensor. The phone is backed by 2.0 GHz cortex-A53 Qualcomm Snapdragon 625 octa-core processor, with 4GB of RAM and 64GB of internal memory. Click here to buy. The HP Notebook BY004AX 15.6-inch Laptop packs a 2.8GHz AMD A9 processor with 4GB DDR4 RAM and a 1TB hard drive. Keep in mind that this laptop comes with DOS, so you have to install your own OS. Click here to buy. The Dell Vostro 3578 comes with an Intel i5 8th Gen 8250U processor. The laptop packs an 8GB DDR4 RAM and 1TB hard drive. The device has a 2GB AMD Radeon 520 graphics and comes with DOS, so you’ll have to install one yourself. Click here to buy. The Acer Aspire 3 A315-51-356P features a 6th Gen Intel Core i3 processor. The device sports a 15.6-inch display with Intel HD 520 graphics. The laptop packs a 4GB DDR4 RAM and 1TB hard drive, which comes with Windows 10. Click here to buy. The TCL 43-inch 4K UHD Smart TV comes with a resolution of 3840 x 2160 pixels. The TV is powered by the Android 5.1 and can be controlled through your smartphone via an app. It also lets users access apps like TED, Youtube and more. Click here to buy. The Sony 43-inch TV features a full HD display with a resolution of 1920 x 1080 pixels. It has a built-in subwoofer to enhance users viewing experience. The device has two HDMI ports and two USB ports to connect external devices. Click here to buy. The TCL 4K UHD Smart TV offers a resolution of 3840 x 2160 pixels with a panel size of 49-inches. The TV is powered by Android and allows users to install apps from the Google Play Store. The device has three HDMI ports, two USB ports, and one VGA port. Click here to buy. The Panasonic Viera Full HD LED offers a resolution of 1920 x 1080 pixels with a panel size of 40-inches. It has a two HDMI port and one USB port as well. The TV offers adaptive backlight dimming for better contrast. Click here to buy. If you’re planning on turning your home into a smart one, then an Echo device is probably a good place to start. The Echo Dot is the most affordable of all of Amazon’s smart speakers and gives you easy access to the company’s digital assistant, Alexa. Click here to buy. If the Echo Dot doesn’t have the ‘oomph’ you are looking for, then you might want to take a look at the standard Echo. This version features a larger body but works in a manner similar to its smaller sibling. However, what you get is much better audio, which makes it a good combination with Amazon Prime Music. Click here to buy. If you want video along with your smart speaker, then check out the Echo Spot. This comes with all the features of the regular Echo speaker, with the added benefits of a screen. This means that you can also enjoy video content. Click here to buy. This one is for the avid readers. Amazon’s popular line up of Kindle e-readers are up for sale, including the most affordable variant, the All-New Kindle E-reader. The device comes with a 6-inch e-paper display, which makes for glare-free reading. Click here to buy. With the Kindle Paperwhite, you get the same glare-free 6-inch e-paper display as the All-new Kindle E-reader. However, with the Kindle Paperwhite, you get the added benefits of a backlit display. So you can continue reading even when it is dark. Click here to buy. If you’ve got a dumb TV and want to make it smart, then you might want to take a look at the Amazon Fire TV Stick. This handy little device sticks to an HDMI port on your TV and gives you access to streaming services such as Netflix and Amazon Prime Video. You also get a remote control with voice activation as well. Click here to buy.